Whenever there has been something in my life that I was not happy with and wished to change, I have found the one thing that has helped me to make that change has been immersing myself in new thoughts. That meant consistently, every day for a while, keeping that thing out in front of me. 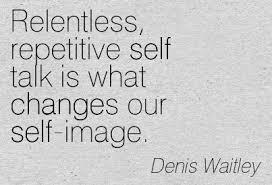 For instance, when I was trying to change persistent, negative self talk, the first thing I would do is write out that negative thing, and on paper, challenge myself. Is it really true? Where did it come from? Do I really want to believe it? Must I believe it? What could I change it to? And I would create my own positive affirmation! For instance, my belief that “I don’t matter” became simply “I Matter!”, in capital letters and complete with exclamation marks! After a while of being consistent with these small things, my beliefs about my self worth began to change dramatically. And I used this technique over and over because I was trying to create new neural pathways in my brain…which IS entirely possible! So, if you have something you are trying to change, keep it out there in front of you. Persistence (without guilt, shame, or beating yourself up!) really does work. Nourish Your Soul/Self This Week – Tell Us How And Win! Join us this week for our “5 days of Nourishing Self Care Challenge” on our Facebook page, and you could win “Cellular Wisdom” – a Gabriel Method CD of guided meditations and music to promote relaxation and calm stress hormones. Set aside 1 hour each day for intentional self care. Post each day on our facebook page and let us know what you did to nourish yourself! That’s it! We begin tomorrow, and the winner will be announced on March 1st. What is the cost to you to say (and mean) these words? How much guilt, or trepidation, or shame, or discomfort is associated with these words for you? 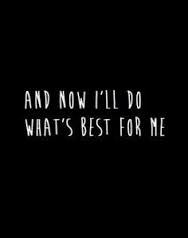 What IS best for you? Do you know? Oftentimes we are so far from our authentic selves that we don’t even know what we want – or what is best! Here are a few ideas to help. Make (and decide to keep) one small promise to yourself. It has to be small – small is the only way to begin to uncover your true self. That true self has been hiding from you, because you do not believe she exists or you have been giving your power away to others for years, so you really don’t believe you have any power to call your own! So, in order to help her trust you again, you need to start small. What’s one tiny promise you can make? Perhaps..today I intend to write in my journal for 5 minutes. Or, today I intend to stop for half an hour to do something I want to do. Or, today I intend to take a 10 minute walk. Or, today I intend to get to bed on time. Make that one tiny promise and keep it. Tomorrow, make another (or the same one!) The important part of this exercise is that you place enough value on yourself to keep One Tiny Promise to yourself each day. Make it an intention. This is how that true part of yourself will begin to believe you mean it – you want to find her. And, no beating up on yourself allowed! If you don’t keep that promise today, make it again tomorrow. You WILL get there. Babysteps are a very powerful catalyst for change. Let’s face it. You’re a busy mom who barely gets time to go to the bathroom alone, let alone practice self care! Or, you’re taking care of your aged father in your home, plus you’ve got kids and a partner AND a job. How can you possibly find time for self care? 1. 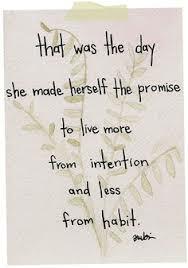 Set an intention. Be committed to finding 15-30 minutes of ‘me’ time every single day. 2. Rise 15-30 minutes earlier than everyone else. Having even a small amount of time to yourself to meditate, pray, do some stretching, or journal can make all the difference to your day. 3. Schedule ‘me’ time into your daily routine. 4. Evaluate your ‘time-wasters’. How much time do you spend on facebook? Are you a person that checks their emails twenty five times a day? Do you run to the store three times over the course of the day because you don’t have a list? Take a few minutes each morning (while the kids are eating breakfast, perhaps?) to prioritize your day – a short to-do list can work wonders in giving you some extra time. 5. Say “NO” sometimes. You really don’t have to be there for everyone, all the time. If you’re a true giver of all your time and energy, saying no will feel uncomfortable at first. And it might surprise the people around you! That’s ok. Saying no to some things in order to nurture yourself is important! Sometimes, thinking of ways to find ‘me’ time can seem overwhelming. The one thing that will help with actually finding time is going to be setting an intention. You’ll be amazed at how you are able to find time when you decide you’re important enough for some ‘me’ time! And, thing is, even if we have extra time nowadays, we fill those moments with gadgets. Cell phone, tablets, laptops, computers…sometimes I think it’s almost as if there’s a conspiracy somehow to keep us from actually stopping long enough to check in with ourselves. I don’t know the answers to those questions. I can make some guesses, though. Our upbringing, our religions, just being a woman can do it! We women in particular have learned that everyone else’s needs must always come before our own. But there’s a major problem with that belief. We are being robbed of our best – and not only us – but those around us as well! We cannot give from a full place if we’re empty! That is what we need to learn. 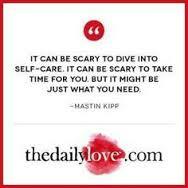 And when we have learned that, many of us will still need to give ourselves permission to ‘dive into self care’. Because it can be scary to give yourself that time, that space – especially when we’re not used to doing it. It can feel awkward, even. Downright uncomfortable! 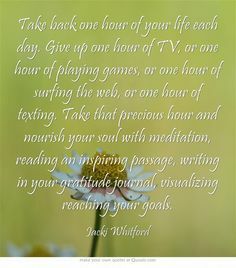 One small step toward honoring your self today: Turn off your cell phone/computer/tablet for one entire hour. Find a cozy corner and start that book that you’ve been wanting to read. Or make yourself a cup of tea and gaze out the window. Try. Doing. Nothing. For one hour – without guilt. We owe it to ourselves to care enough to choose good things….just for us. Who is the world to tell us we don’t deserve it? And why do we listen?